So 2 Chainz is a rapper who changed his name from Tity Boi to be more family-friendly. Which is funny, and also not all that weird, when you think about both how much he wants to sell records and how much he loves his two daughters, Heaven and Harmony. If Instagram counted in real life, the Atlanta emcee would be Rap Dad of the Decade. Yes, his food Instragrams have garnered a lot of attention, but his kidstgrams deserve their own spotlight. I mean, lots of rappers make a big show out of spending time with their kids and showering them with gifts, but you can kinda tell it's just for show. 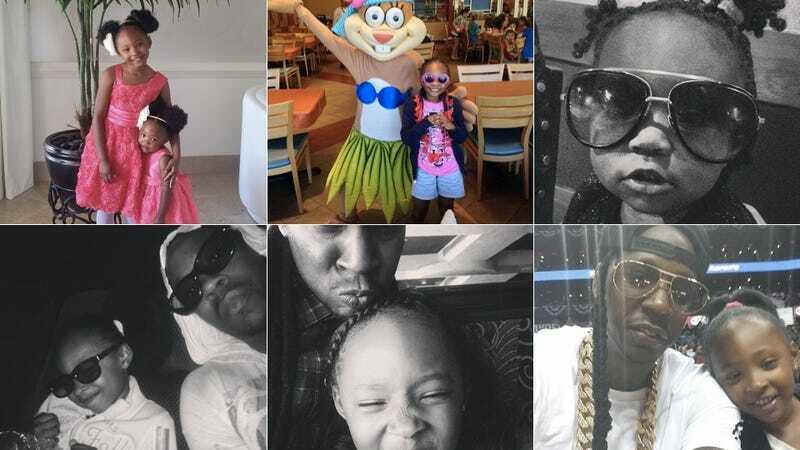 Whereas 2 Chainz seems like a pretty good dad: You know, the kind of dad who goes to school assemblies and bad third-grade pageants and such. He's around these girls a lot! And they are very cute. His constant state of amusement when they're involved is pretty cute, too. The following is a celebration of 2 Chainz hanging out with his girls. Point of order: Be sure to turn up the volume, so you can hear the whoa's and be careful's and get it, girl's that characterize 2 Chainz's Running Dad Commentary. He loves to take them to Hawks games, and they obviously have great seats. Another game. Caption: "Bribe them with sugar." I mean, come on. They love the Hawks. Makes sense that the two would be fans. Two-year-old Harmony might have a bright future on the court. Seriously. She started young. This video is many months older. I mean, if they're going to a wedding, of course 2 Chainz is going to cut it up on the dance floor with his main girls. This FaceTime rendition of "Let It Go" leads me to believe Heaven might follow in the family business. Harmony, too, for that matter, although I'm not exactly sure if that's the ABCs or what. They certainly like their dad's music, though. Believe you me, Christmas 2014 was LIT at the Epps house, and I know of two little girls who made out like little bandits. Same deal with Christmas 2013. And he wouldn't be such a top-level dad without a school pic, uniforms and all. He is the source of some solid dad-couragement. They really love those four-wheelers. And you're going to die a bit, but here's Heaven's Christmas pageant. Stay for Tity Boi's oohhh-kay, hahaha at the end. You can tell he's proud! He follows all of his little girls' activities, just like a good dad does. Heaven had a good year in karate. There are several more videos and pictures like this from that same karate showcase, because, DUH, 2 Chainz is a proud dad. The Epps family should release an official "Old MacDonald" remix, because the music thing really runs in the family. Related: Look at Heaven killin' it at her piano recital last year. Like every child in America, Heaven and Harmony love the movie Frozen, and went as Olaf and Anna for Halloween. Their dad, however, went as Rick James. The Frozen thing, BTW, is a longstanding obsession for these gals. Here's another "Let It Go" jam sesh from about a year ago. In addition to basketball, 2 Chainz is also instilling a love of tennis in his girls. Which is probably not hard, when you're meeting one of the greatest tennis players ever. But for all of the cool, crazy rich-dad stuff he takes them to do, he also just hangs out with his kids like a normal dad.